As our mild winter draws to a close we need to make the most out of the slightly cool days that remain. 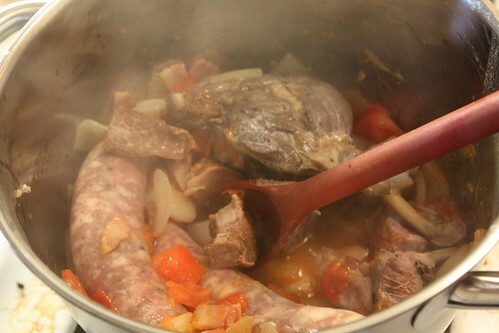 With temperatures dipping into the twenties this evening I felt this may be one of our last shots at making another winter type stew. 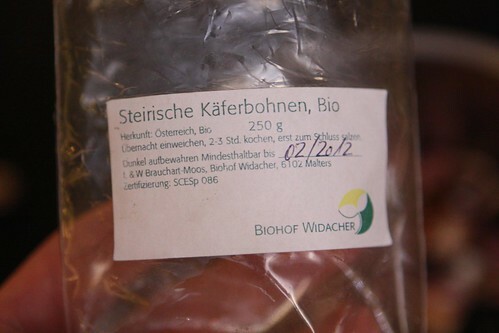 We have long had these great beans that we picked up at the Lucerne Market in Switzerland last summer. While not standard I thought I would use them in a cassoulet. Knowing basically no German I couldn't really make out much on the package other than the "best by" date which was February 20, 2012, surprisingly not written out in the European dating convention. I didn't actually translate this until after the beans had been cooking for a while but luckily my bean intuition didn't lead me astray. 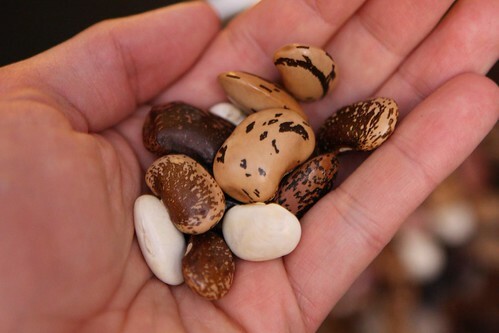 I'm just hoping that there was something amiss in the translation and that these are actually Beetle Beans, not Bean Beetles. While we may watch a lot of No Reservations I don't think either of us has a strong desire to eat bugs. Render some bacon in a pan. Add onions and garlic to pan and cook for seven minutes. Remove onions and garlic from pan and set aside. Brown some sausages in a pan. Brown some pork shoulder in a pan for five minutes. Remove pork shoulder and set aside. Add everything back into pan. Add chicken stock, wine, and tomato to pan. Cook on low heat for six days. Cook on low heat for six days an hour or two, or as long as you'd like. After soaking the beans overnight on Friday, and having Jen cook them last night, we were ready to proceed. So I guess this recipe did take three days to make. Sort of. In my neverending effort to only use one pan to make dinner I rendered some bacon then tossed in some garlic cloves and chopped onion to cook down with just a little olive oil. After a few minutes I added some chopped tomato then some leftover ham steak from the freezer, some garlic herb sausages, and a confit duck leg. I then covered them with some chicken stock from the freezer and added a dark strong ale (in lieu of the recommended white wine) and cooked it in a pot on low heat for about six or seven hours. The resulting dish, served with chopped parsley and baguette, was pretty good. 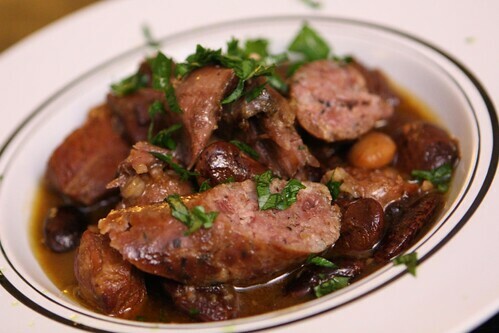 Maybe it's not as good as your average gourmand who takes three days to make their, however mine was ready for dinner tonight and was a far cry better than having nothing for dinner tonight then having a cassoulet that is ten percent better on Tuesday. 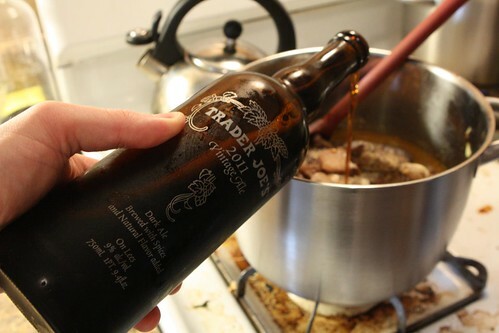 To pair with this winter stew I poured this Trader Joe's 2011 Vintage Ale which Jen's father got me for Christmas. 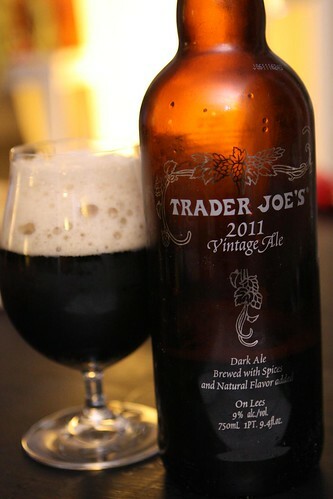 According to Beeradvocate this is brewed by "Trader Joe's Brewing Company." However, just looking at the silver writing on the brown bottle makes it quite obvious it was brewed by Unibroue, one of my favorite breweries. This is not the most overly complex Belgian style strong dark ale I've ever had but at $4.99 a bottle I can't think of a better beer for the price. It is inconceivable to me that a beer this nice could be priced that low. Comparable beers in 750ml bottles rarely are priced lower than $9.99, even when they're not all that good. 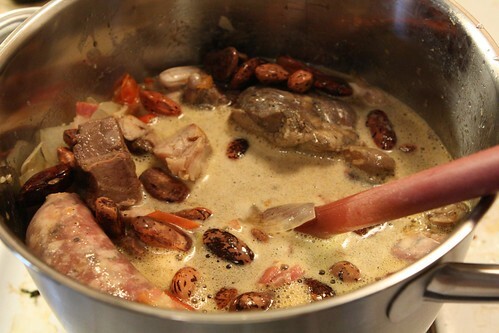 It was a little difficult to do but I even shared a little with the cassoulet. After dinner, which was pretty filling, we were left with the culinary question: what does one have for dessert after this classic French dish? 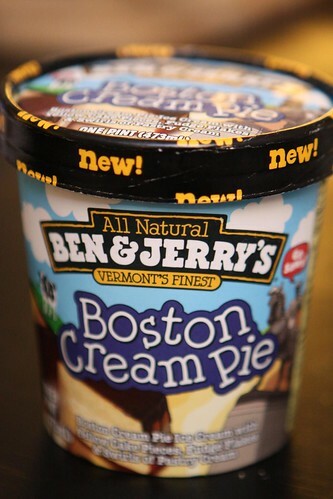 Ben & Jerry's Boston Cream Pie ice cream, that's what! Holy hell, this is a good idea. Boston Cream Pie is one of my favorite desserts of all time so when I spotted this ice cream at the grocery store I stopped dead in my tracks and snatched it out of the freezer case. I was so excited that I almost forgot to open the glass and nearly put my hand through the glass. It's basically a custard flavored ice cream with bits of chocolate and yellow cake in it. It's pretty much the best thing that has happened to me so far this decade. It's going to be tough to beat.